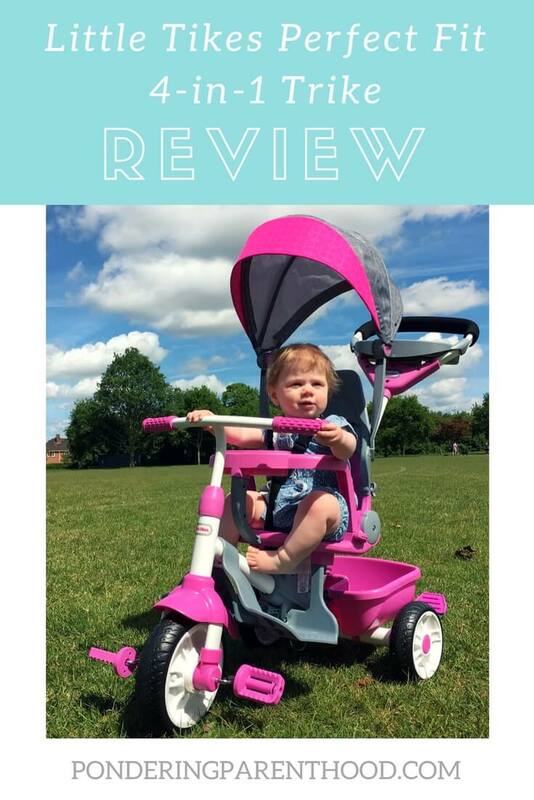 Hubby and I discussed buying Little M a trike for a few months before her first birthday, so when Little Tikes sent us their Perfect Fit 4-in-1 Trike to review, we were super excited. Until we came to put it together. It took us about an hour and a half. There was a significant amount of swearing. To be fair to Little Tikes, it was late, we were tired, and we kept not following the instructions properly and had to repeatedly undo what we’d done to put it right. So the amount of time spent putting it together if you’re an awake, sane, literate person (which we didn’t appear to be that evening) would, I imagine, be considerably less. Anyway, I can hand-on-heart honestly say that the end result is worth any psychological trauma inflicted by assembling this Little Tikes trike. It’s fantastic. Little M adores it. She loves being driven around the garden, while she babbles ‘vroom vroom’ noises and makes indicator clicking noises with her tongue. Little M loves the swings at the park, and having this Little Tikes trike has enhanced her park experience no end. I’m convinced she drinks more water while we’re out when she’s in her trike, as she loves having her cup in the little cup holder at the front. When she’s had enough and decided to chuck her cup over the side, I can pop it in the ‘adults’ tray on the handle, which, in addition to the cup holder, has a handy slot for your mobile phone and will very capably hold your keys and a snack, too. The basket on the back of the trike is also surprisingly capacious; it held two picnic blankets and our lunch when we went to Eaton Park (one of my favourite local places to walk with the trike) on Little M’s birthday. My favourite thing about the Little Tikes Perfect Fit 4-in-1 trike, though, is its longevity. It’s suitable from 9 months up to five years, making it a really sensible investment, considering that it costs a mere £15 more than a Jumperoo, which is blighting my living room and lasts for a fraction of that time, age-wise (Little M did love it, though, I’m just too lazy to put it down, as she still likes a quick bounce occasionally!). Anyway, the Little Tikes Perfect Fit 4-in-1 Trike grows with your child as it goes from being pushed and steered by the adult, to being pedalled by the child while the adult keeps control of the steering. From there, you can remove the waist bar so that the child can steer themselves, while keeping a corrective hand on the handle. 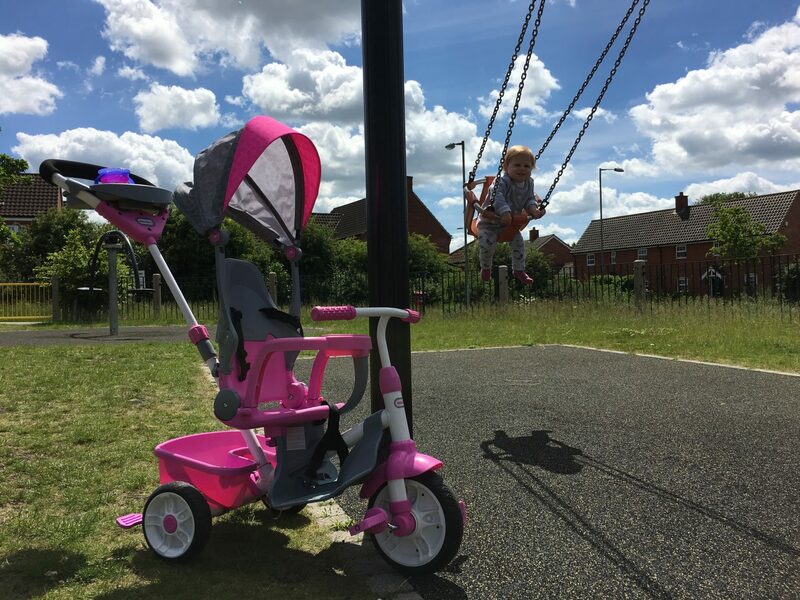 Once you’re confident that your child is able to pedal and steer without crashing into trees/dogs/other toddlers, you can remove the handle and they can have complete control over the trike. It sounds fabulous, and I can’t wait to see how Little M grows with it. For now, Little M is enjoying being pushed around and will clap, wave and squeal with delight as we travel along. 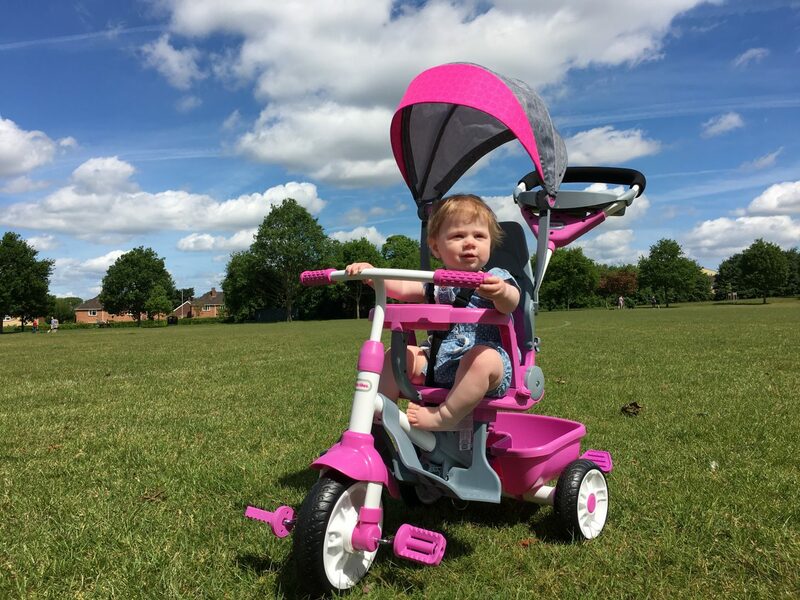 It’s definitely enhanced her park life and we’re so pleased that we were able to give it to her for her first birthday. I highly recommend it! Just remind yourself of how great it will be when you’re taking it out of the box and putting it together! Disclosure: We were given this Little Tikes Perfect Fit 4-in-1 Trike in order to provide an honest review. All opinions are my own.